Nestle�s rich chocolate bars get their popular name from the Holy Roman Emperor known as �Carlos V� who introduced chocolate to the courts of Europe. For this reason the product is widely known in Mexico for its quality chocolate taste that isn�t overwhelminglysweet. 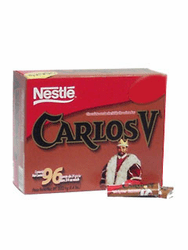 You too can enjoy the taste of Carlos V Swiss chocolate bars and discover why they�re so popularly known in Mexico as �The King ofChocolates��and they sure are! Carlos V is the perfect candy on the go, just open these treats and biteinto their exquisite milk chocolate goodness. Carlos V�experience a rich history with the King of Chocolates. The Authentic Mexican Milk Chocolate Bar. Store in a fresh dry place. Ingredients:sugar, chocolate, nonfat milk, cocoa butter, whey, milkfat, vegetableoils, and less than 1% percent of soy lecithin, artificial andnatural flavors, PGPR (emulsifier). Las barras de chocolate de la marca Nestle obtuvieron su tan popularnombre del emperador Romano conocido como �Carlos V� ya que elfue quien introdujo el chocolate a los tribunales de Europa. Por estarazon el producto es conocido en Mexico for sabor de calidad ychocolatoso sin ser exageradamente dulce. Tu tambien puedes disfrutar del deleitable sabor de las barras dechocolate suizo de Carlos V. Pruebalo y descubre porque es tanconocido en Mexico como �El Rey de los Chocolates��y va que loson! Carlos V es el dulce perfecto para llevar a cualquier parte, solo abre una barra de chocolate y disfruta su exquisito sabor a chocolate conleche. Carlos V�siempre una rica historia en cada barrita. La autentica barra Mexicana de chocolate con leche. Ingredientes:azucar, leche sin grasa, manteca de cacao, suero, grasa lactea,aceites vegetales, y menos del 1% de lecitina de soya, saboresartificiales y naturals, PGPR (emulsionante). The hot chocolate was delicious, and easy to make. Everyone in my family loved it.